Puppies arriving Spring 2019, contact us now to get on the wait list! 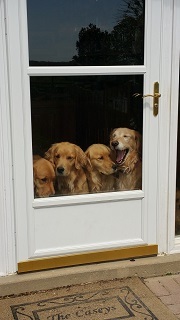 Contact Diane here or, see us on Facebook at Casey Golden Retrievers. Welcome to our website, we hope it helps you find the perfect addition to your family. 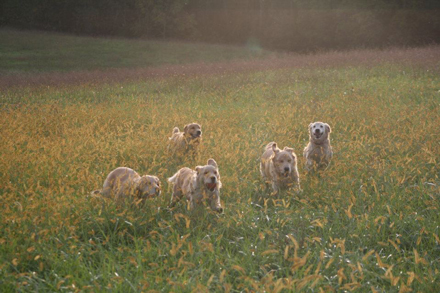 Located in Northern Virginia's horse country, our grown up Goldens have free run of our 16 acres. We find that this produces happy, friendly dogs who socialize well with each other as well as with their human family and friends. Each dog is treasured for his or her unique personality. All of our dogs are AKC registered and have their clearances. In addition, all are descended from multiple national champions. We have a long list of happy family matches and can provide references. Don't hesitate to reach out to us with questions! Litters are born in our home in warm and familiar surroundings. Mom and babies remain the mainstream of family life and are loved, cuddled, and admired on a regular basis. We get to know our babies well and have become quite good at matching puppies to new families.